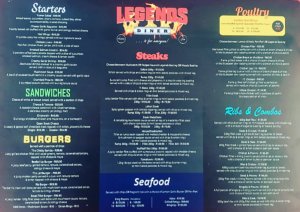 Legends Diner is the place to be if you enjoy good food with hearty portions.  This eatery is situated at 460 Peter Mokaba Ridge, Essenwood, Berea, 4001. 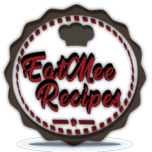 As many know, EatMee Recipes also has a Facebook group (South African Food – EatMee) with over 40k members contributing recipes & daily meals. 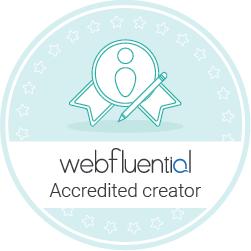 It is a friendly community related to everything that has to do with food. 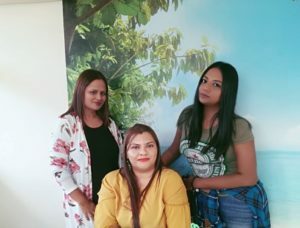 When the group was created, we allocated moderators so that the group could be efficiently monitored, the moderators of the group are Saliema Khan & Naz Roberts, with myself, Denisiya Hemraj being the admin. Having only introduced ourselves on Facebook, we as a team decided that it was time to meet face-to-face. We decided to meet over lunch & chose a restaurant that neither of us has been to, so that we could also share our thoughts on the food. We chose to meet & eat at Legends Diner. 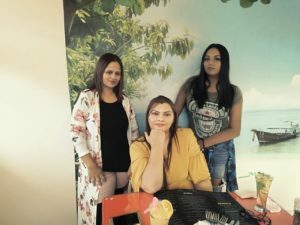 This restaurant is fairly easy to find as they have big boards placed outside the building, so you wouldn’t have a hard time searching for it – especially on an empty stomach. The restaurant has three levels of seating areas which is great if you’re going in with a large group of family or friends. 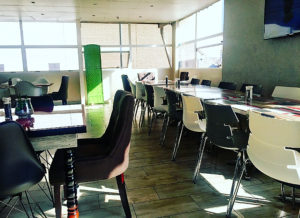 The seating areas are also very spacious so you don’t feel claustrophobic & can concentrate on enjoying your meal. 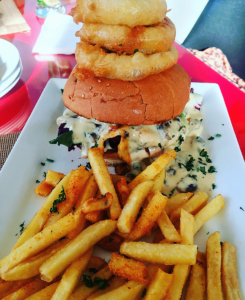 Once I met with Saliema & Naz, we could hardly wait to start placing our orders as we three agreed to come in with an empty stomach after seeing all their fabulous food pictures online.  Their menus are really easy to read, with a description entailing what your meal includes. We started off by ordering our drinks as we had to quench our thirst whilst catching up. 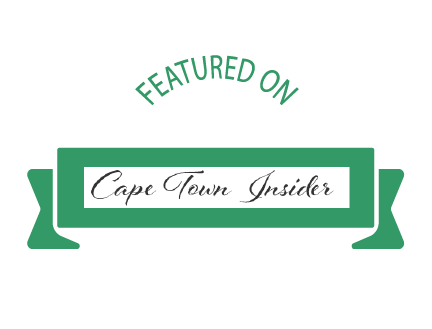 Saliema Khan had ordered the Watermelon Mojito, Naz Roberts ordered the Mango In Paradise Mocktail & I ordered the Ferrero Rocher Milkshake. The Watermelon Mojito flavour was unfortunately non existent as per Saliema. She stated that it was watery with only the taste of mint & lemon & no actual flavour of the watermelon. 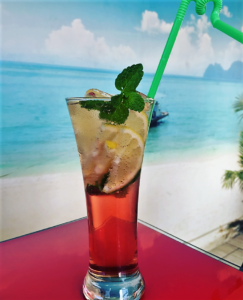 Whilst making a decision on her choice of drink, she did question the waiter, asking him about the textures of certain drinks & when she had asked about the Mango In Paradise Mocktail, he advised her wrongly which showed that he wasn’t very clued up on the drinks menu. 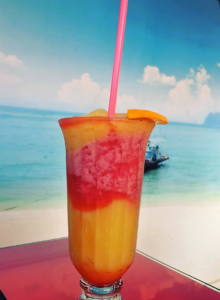 Naz said that her order of the Mango In Paradise Mocktail was very refreshing, she added that it was thick, much like a smoothie but she thoroughly enjoyed it. 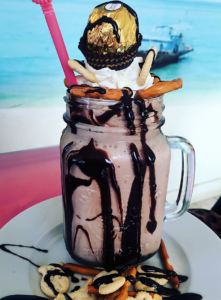 I love a good milkshake so when I saw that they had the Ferrero Rocher Milkshake, I just had to give it a try. Usually whenever I order milkshakes, it’s always super thick & leaves you feeling really full that you’re unable to enjoy your meal, although to my surprise, this milkshake was by far the best I have ever tasted! It has a creamy chocolaty taste & it was not thick! 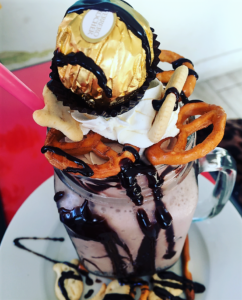 They also decorated it with pretzels & salty crackers which added a nice touch to the drink – not forgetting the Ferrero placed delicately over the top. I thoroughly enjoyed my milkshake & would definitely recommend it if you’re a milkshake lover like I am. Next, we needed to snap some pictures because how could we not right? The waiter was really kind in taking the pictures for us. After the pictures, came the starters. We three decided to share the Cheesy Garlic Baguette. This starter is definitely not for one, it is huge – not the ordinary style of garlic rolls usually served at most restaurants! By the time we were done, we were worried that we may not have room for the main course. 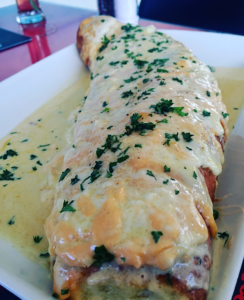 Naz said that this Cheesy Garlic Baguette was super moist, amazingly delicious & she could be quite satisfied with just having this starter as a meal on it’s own as it is by far the best – Saliema & I totally agree with her. After the starters, we got to the mains. I ordered the Steak Fillet Burger, whilst Saliema ordered the Steak & Prawns, & Naz ordered the Kingclip. Saliema’s meal looked really good, with her steak, there was a choice between the masala basting for the steak or the Legends basting & she had chosen the Legends basting. The prawns had a choice between two sauces being the peri-peri sauce & the lemon butter sauce. 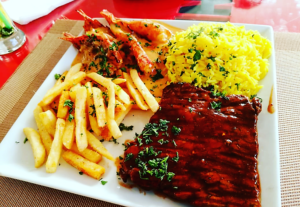 Saliema chose the peri-peri sauce as she wanted to add some spiciness to her meal. She stated that the peri-peri sauce over the prawns was more of a mayo/vinegar based white sauce with peri-peri & she definitely wont opt for that flavour again. Saliema also added that the chips were dry but the steak was perfect & the prawns were huge & well cooked. 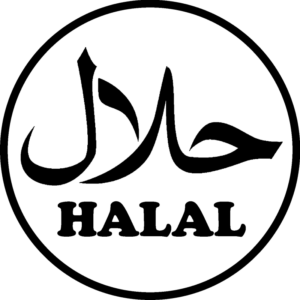 The owner, Mohammed was very courteous & always came to our table, asking if we were content. 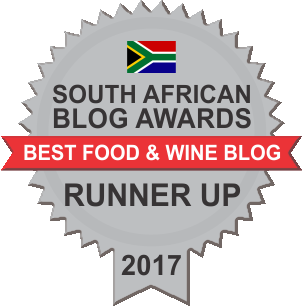 He also asked for our honest opinions on the food & Saliema told him about the peri-peri sauce over the prawns which was not to her liking. 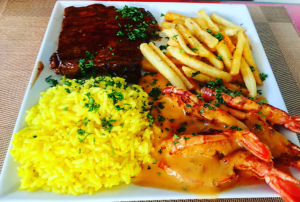 Mohammed offered to switch her prawns but Saliema had already ordered a side of the lemon butter sauce, so there was no need for the exchange. 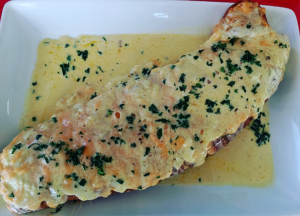 Naz opted for the grilled Kinglip as her main meal with lemon butter sauce & chips. Naz said that she loves Kingclip & this was done to perfection. 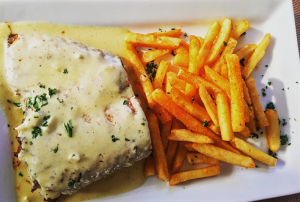 She added that the lemon butter sauce is the bomb, although she did find the chips to be a bit dry, she said that maybe a drizzle of some kind of sauce over the chips would have made the meal perfect – but she did enjoy it, no doubt! My meal was the Steak Fillet Burger. Anyone who knows me, knows that I love me some burgers & I love steaks, but I always have a tough choice choosing between the two. 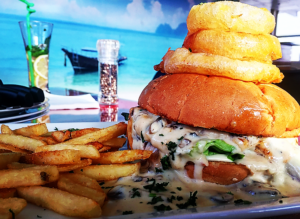 At Legends Diner you won’t have to worry about choice because here you get the best of both & my oh my was this burger something out of the ordinary. 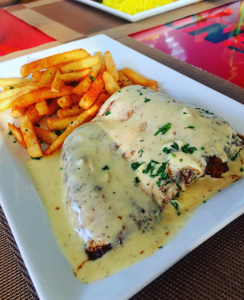 The steak fillet was so tender, juicy & simply melted in your mouth. I have never tasted steak done so well before. This burger is definitely a 10 from me, it had just the right amount of sauce & everything was fresh. 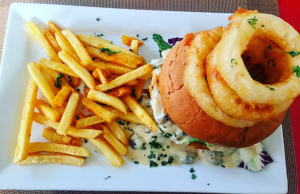 The onion rings are an additional cost of R15 but it was so worth it. It was crisp & delicious. I unfortunately have to agree with Naz & Salema when it comes to the chips though, it was a but dry but overall I really enjoyed my meal. It was fulling & hit all the right spots! We three were stuffed after our main meals & didn’t get to try out any of the desserts, but its a definite next time for us. We were all happy & even more excited that we got to share great meals on our first time meeting one another. 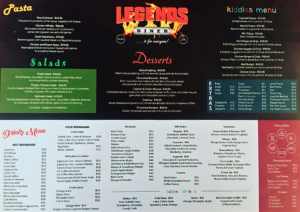 Naz, Saliema & myself highly recommend Legends Diner to be added to your list of must eat places. 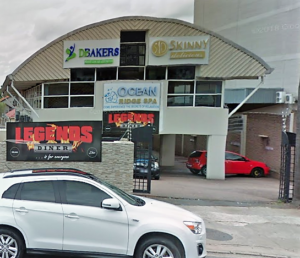 Also take note that Legends Diner is a Halal/Halaal Restaurant.